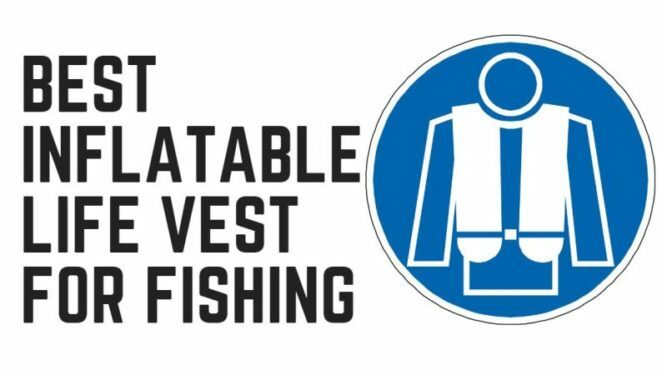 We have reviewed some of the top-rated life jackets on the market to help you buy the Best Inflatable Life Vest for Fishing. 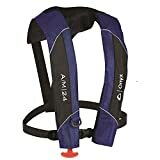 Onyx A/M-24 is the Best Inflatable Life Vest for Fishing as per our reviews. Onyx A/M-24 is the number one choice to go with. Simply put, it provides safety and peace of mind each time you go fishing. It is so comfortable and lightweight you won’t even know you have it on. You can easily wear Onyx A/M-24 the whole day fishing. Fishing is probably one of the most fun activities you could engage in on a nice and sunny day, or even before the sun comes up. But falling into the water without a life vest can be a recipe for disaster. You should wear a life vest or a life jacket whenever you go out fishing especially when you are fishing from a kayak or a boat. We have reviewed some of the best inflatable life jackets for you to look at. Let’s take a look at some contenders for the title of the best inflatable life jacket for fishing. You should definitely be able to find one that suits your needs. This is a US Coast Guard approved Type V life jacket with Type III performance. In other words, according to the Coast Guard, this is one of the best life jackets you can get your hands on. What we like about this life vest is that it is made out of extremely durable materials. It won’t rip or fall apart when you need it the most, plus it dries quickly. One of the best aspects of this life vest is that there are 3 ways to inflate it for some added safety. The Onyx Inflatable Life Jacket features a CO2 canister and drawstring to automatically inflate within seconds. In case that does not work for some reason, it does come with a blow inflation tube, so you can use your lungs to get the job done. For even more safety, this life vest will automatically inflate itself if you come into contact with the water. This life vest is ideal for most adults and is fully adjustable to make sure that you get a secure fit. It is a secure life jacket, while at the same time also being very comfortable and low profile. We like this life jacket for various reasons. First off, it is CE certified and SOLAS approved, meaning that it meets minimum safety standards. It does come with reflective strips to make sure that people can see you floating in the water. 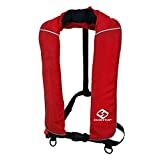 We also like this life vest because it is reusable, it can be washed, and it also dries really fast after getting wet. The Eyson Inflatable Life Jacket has a buoyancy rating of 150N and is suitable for all adults. It is a universal life jacket that can fit anybody up to 330 pounds. 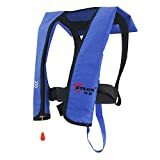 Eyson A/M Inflatable Life Vest features fully adjustable straps, so you can tighten or loosen it to give the right fit that will keep you safe in case something goes wrong. It is so highly adjustable that it can actually be used for youth too. The fabric which the Eyson Inflatable Life Jacket is made of is extremely durable and can take some bumps with no problem. It features a drawstring and CO2 canister which automatically inflates it for quick lifesaving action. You also get a whistle with this life vest, so you can call for help if someone is nearby. This model is the ‘Deluxe’ version of the Onyx life vest we just looked at. It comes with utility pockets and a padded pocket for sunglasses. It also features padded air mesh for enhanced comfort on the back and straps. The Onyx A/M-24 Deluxe Inflatable Life Jacket features 3 different methods of inflation to make sure that you are always safe. It features a CO2 canister and drawstring, which inflates it in mere seconds. You can also blow in the tubes to inflate it with good old lung power. In case you take a bump and go unconscious, it also inflates automatically if you fall into the water. This is a US Coast Guard approved personal flotation device. It is ideal for anyone over 16 years old and heavier than 80 pounds. It can be adjusted using the straps and buckles to ensure the tightest fit possible. Even though it is snug and secure, it is built to be unobtrusive and features a low profile to stay out of your way. The whole thing is built tough, it’s built to be comfortable, and of course, is designed to save lives. When it comes to your safety on the water, in our opinion, this is probably one of the top options out there. One of the reasons for this is because it can be inflated in 3 days ways for the ultimate in safety. First off, it features a CO2 canister which causes the life vest to inflate the second you pull on the inflation drawstring. If the drawstring does not work, you can always manually inflate it using the blow tubes, just like blowing up a balloon. Finally, in case you took a nasty bump or fall and can’t do anything yourself, this live vest actually inflates automatically once you make contact with the water. This particular life vest has a buoyancy rating of 33 pounds, which is fairly good. 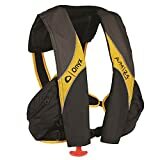 In terms of the best inflatable life vest for fishing, the Onyx A/M-24 Automatic/Manual Inflatable Life Jacket is definitely our number one choice. It appears to be the safest, most comfortable, and least obtrusive option out there. The Eyson Inflatable Life Jacket is also a great option to keep in mind.